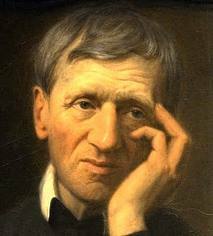 For a good number of years, without really knowing too much about him, I have felt an attachment to the person of Blessed John Henry Newman. Like other saints that I've met along the way something about him attracted me. It's not because I've read much about Newman or by Newman. Somehow, somewhere along the way, I've just felt a kinship with him. A few months ago, someone sent me a biography of Newman which I picked up but never finished. A few weeks ago, however, after another friend suggested that I read a particular sermon by John Henry Newman, my interest was once again piqued, and I flew through that biography. Reading about his life made me feel all the more attached to him and interested in learning more about him and deepening our spiritual friendship. My intuition for the past twenty years or so has been that what is needed in the life of the Church is a more profound experience of friendship. When people live and experience true Christian friendship, it draws them closer to the Lord. We want more vocations, more active parishes, more conversions, more communion among prebyterates and bishops . . . ? The answer is friendship. Newman knew how to live friendship and that friendship bore fruit in the life of the Church. No sooner had I finished Newman's biography, I picked up another book entitled, "God or Nothing"
by Robert Cardinal Sarah and published by Ignatius Press. I knew very little about Cardinal Sarah before I began reading his book (which takes the form of an interview with him). I have been really struck by his humility, sincerity, and intelligence. 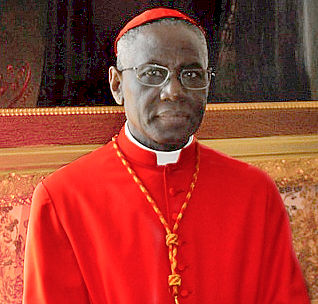 Cardinal Sarah is the Prefect for the Congregation for Divine Worship and the Discipline of the Sacraments. Among other things, what is so remarkable about Cardinal Sarah is that he has no business being where he is! Born in a remote village in the African nation of Guinea, Cardinal Sarah should not even be Catholic, never mind a Cardinal in the Vatican! What is so striking throughout the book (which I am only halfway through) is Cardinal Sarah's profound spirituality. Cardinal Sarah repeatedly returns to an urgent plea for all of us to grow in intimacy with God. I have been reading quickly through his book, but could read even more quickly were it not for the fact that I have to keep putting the book down so that I can go and pray. Cardinal Sarah's insistence on the need to grow in holiness and in a life of prayer continually causes me to pause reading so that I can go to the chapel and pray. His words and his example drive me to my knees. As I read his reflections, I am moved by his life which is clearly nourished at the fountain of prayer. When I read what he writes, I think, "I want to be a better priest. No, I NEED to be a better priest." Blessed John Henry Newman's life is one that was centered on the person of Jesus Christ. Cardinal Sarah's book, thus far, is centered on the need of every person (especially priests and bishops) to be close to Jesus Christ. We need to be holy. The Church needs men and women who are in love with God, who live life close to God, and who are able to communicate to others the good news that God is near us. Additionally, both men have suffered in various ways for their love of Jesus. In this way, they remind us that holiness is always achieved through the Cross. If you are looking for some good spiritual reading that also has profound reflections on the current state of the Church and the culture, I highly recommend to you Cardinal Sarah's book, "God or Nothing." All I know is that as I read his book, I keep thinking, "I want to be holy." That, to me, is a sign of an excellent Catholic book. We all need to grow in holiness. Surrounding ourselves with good witnesses--be they here on earth or in heaven--and good Catholic books can help us towards our own growth in holiness. Today, I'm grateful for two such witnesses and books. Blessed John Henry Newman and Cardinal Sarah, thanks for reminding me what it's all about: living a life of holiness, friendship with God and with one another. St. Matthew tells us that when the star came to rest over the house where Jesus was, the Magi were overjoyed. They entered, saw the child with Mary, His Mother, prostrated themselves, gave homage, and offered their treasures. Yes, the Magi experienced "overjoy." They saw, prostrated, gave homage, and offered. There is something so pure and beautiful about this scene. Imagine, they had travelled all of this way and were met not by a choir of angels--as were the shepherds--but by the familiar scene of a child in the arms of his mother. 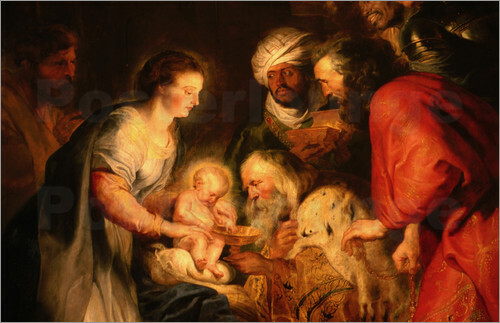 The Magi were not disappointed by the simplicity of their discovery. It moved them to their depths, causing them to fall down and worship and to offer their treasures. The Magi were able to be overjoyed because they were humble. They were men who sought the truth and worshipped the Truth and recognized that they were not masters of the truth but rather servants of the truth. It was humility which caused them to leave one place and to go to another. It was humility that caused them to pause at Herod's palace and seek the counsel of others. And what of Herod? Was not the same star visible to him? When he heard of this news, could he not have followed the star himself and gone with the Magi in search of this new king? No, Herod instead sends others on his errands. He is content to let others go and search while he rules over his petty kingdom. There is, I think, a similarity between Herod and the Devil. Recall later in St. Matthew's Gospel, when the Devil tempts Jesus and takes him to a very high mountain and shows him all the kingdoms of the earth. He promises Jesus all that is below. The Devil can only look down. He refuses to look up and see God. Similarly, Herod can only look down and see his small kingdom. If only he would have looked up, he too would have been rewarded with the vision of the star. But, he was trapped in his own small world. Herod reminds me of Gollum in the Lord of the Rings. Possession of the ring and its power caused him to become a distorted and pathetic creature. Instead of contributing to his happiness, it destroyed him and was the source of violence and suffering to many others. There is a little Herod in all of us. And, like a little poison, a little Herod can do a lot of harm. We too can be trapped in our petty kingdoms. Have you ever met someone who is obsessed with money? They always think that everyone is trying to steal from them, charge them too much, or pull one over on them. Because that is how they treat everyone else, that's how they think everyone else is. Or the person who is envious experiences sadness when others do well. Or the person who is obsessed with pleasure thinks that everyone else is living in that same perverted world. Or the person who is obsessed with power thinks that everyone else is a threat to their power. Whether it's our power, our pleasures, our kid's sports teams, our careers, our money, our entertainment, our hobbies, our grades, or even our relationships, all of us have our kingdoms. These are not bad things, but, when they dominate our field of vision, become our gods, and enslave us, they can make us incapable of doing what is most noble in our nature. They hinder us from looking up, from being overjoyed, from seeing, prostrating, and offering. Herod refused to go out from himself and his petty kingdom. He refused to look up, to look beyond himself and the things of this world. Herod placed his confidence in his power and in his politics. His confidence was misplaced. No earthly power, no political alliance, no political leader, no promotion, no possession, no pleasure, no position, no anything that the Devil promises us as he takes us to the heights and points below will bring us true and lasting joy. True and lasting joy is found only in those who are willing to humble themselves, look beyond the world below, and follow the Divine light of Faith. Herod stayed at home and guarded viciously the absurdity that his life had become. The Magi humbly followed. They looked up. They found God in the arms of His Mother. They worshipped and opened themselves. The Feast of the Epiphany presents to us two paths. It points out the path of Herod which is the path of Satan. It is the path that leads one into the depths of Hell, a life that is closed in on itself, going from one level of self-centered pettiness to the next, causing all manner of warped and distorted behavior. The other is the path of Faith. It is the path of humility that leads one from pettiness to grandeur. It leads one to the house of God where God is discovered in the arms of the Virgin. It leads one to fall down before the Majesty of God and to open one's whole life before Him. As we consider our own lives, perhaps all of us can identify the kingdoms that have been shown to us by the Devil. Much like the ring in the Lord of the Rings, these kingdoms can become an obsession for us, causing us to lose our way and, under the guise of a false happiness, can drag us into the abyss. The grace of Epiphany can awaken in all of us the memory of what has been given to us. We too have seen His star. We too can look up again and allow the light of Faith to lead us to the Kingdom that lasts forever. The grace of Epiphany draws us away from our earthly kingdoms and gives us the great joy of worshipping the One who alone is worthy. The grace of Epiphany moves us to offer all we have to the Kingdom that never will pass away, the Kingdom that is found in the arms of the Blessed Virgin, Jesus Christ, the Lord.